MultiChoice is fond of increasing prices for their bouquets. This is not the first time we are getting this kind of update from the company, Anyway, DSTV subscribers will get a new price list for some bouquets come August 1st, 2018. This is quite a sad news to subscribers as many won't find this cool. 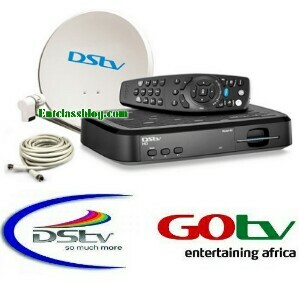 Multichoice Nigeria has decided to increase some prices for their DSTV bouquets and as well reduce price on its GOtv Max package. 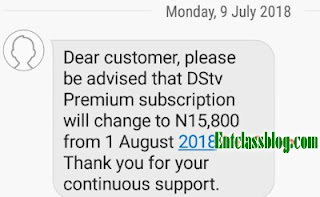 DStv Premium subscribers will have to pay N15,800 as against the old price N14,700. Compact Plus subscribers will have to pay N10,650 as against the old price N9,900. Compact subscribers will pay N6,800 as against the old price N6,300. Family subscribers will pay N4,000 as against the old price N3,800. While Access subscribers will pay N2,000 as against the old price N1,900. Subscribers on GOTV Max package will enjoy a reduced price from N3,800 to N3,200 while the prices on GOTV Plus, GOTV Value and GOTV Lite packages remains at their old price - N1,900, N1,250 and N400 respectively. MultiChoice is yet to release an official statement regarding the new price list as at the time of this publication. This is not good at this time from DStv as economy of Nigeria is unstable, what I expect from them is reduction of the subscription prizes.